"Trust me everyone, I have traveled with this man, if Gerry Dawes tells you to eat somewhere it's like Bourdain, believe it!!" - - Chef Mark Kiffin, The Compound Restaurant, Canyon Road, Santa Fe, New Mexico. Gerry Dawes at Marisquería Rafa in Madrid. Gerry Dawes is the Producer and Host of Gerry Dawes & Friends, a weekly radio program on WPWL 103.7 FM Pawling Public Radio in Pawling, New York. 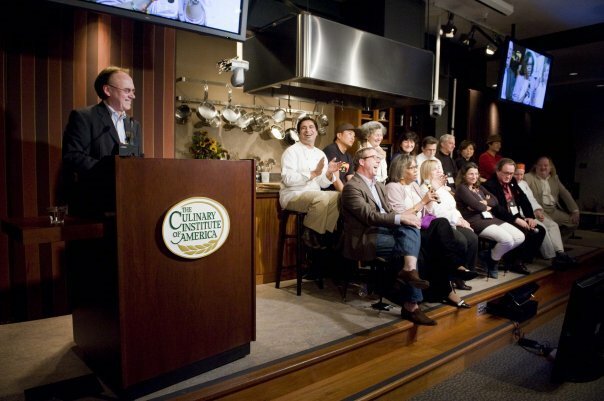 This influential annual three-day forum on world cuisines is one of the American foodservice industry's premier events. Each November, the Worlds of Flavor Conference showcases the gold standards of world cuisines that are reshaping American menus. The 12th Annual Worlds of Flavor Conference presented an in-depth exploration of two overlapping, hot culinary trends: world street food and world comfort food. Reflecting the intersection of recessionary budget and cost-cutting pressures, the continuing world cuisines juggernaut, and the ongoing embrace of a 24/7 culture of informal, casual food and dining, these concepts increasingly define how we as Americans now want to eat. "Frontiers of Flavor: World Street Food, World Comfort Food," gathered top culinary talent from the Mediterranean, Asia, Latin America and the United States. Presenters included more than 60 culinary experts, from street food vendors, hawker chefs, tapas and meze specialists, and barbecue masters to fine dining chefs who have been inspired by world street foods and comfort foods, mothers of chefs, legends of live fire and claypot cooking, as well as cookbook authors, street food chroniclers, and more. Highlighted regions and food cultures included Singapore, Malaysia, Thailand, Vietnam, Indonesia, Japan, India, Spain, Italy, Greece, Turkey, Morocco, Tunisia, Persia, Mexico, the Caribbean, Peru, Brazil, and culinary hot spots across the United States. The three-day event was a sauce-slopping, noodle-slurping, chaat-sampling, kabob-nibbling, tamale-savoring, tapas-grazing epic tour of the best of world street food and world comfort food! Gerry Dawes moderated one general session, three panels on Spanish and Catalan Cuisine and appeared in the final general session as a commentator. Profiles of the participants, photos and some recipes for the Spanish sections of the Worlds of Flavor Conference will follow. With a live video feed from the outdoor live fire kitchen previewing lunch with Mai Pham (Vietnamese food) and Suvir Saran (Indian food). What's Next in Spain: Fast, Slow and Casual Flavors. and Albert Asin (Pinotxo, La Boqueria, Barcelona). Photo by Terrence McCarthy, TMC Photography©2009. cooking at CIA-Worlds of Flavor. Photo by Gerry Dawes©2009. 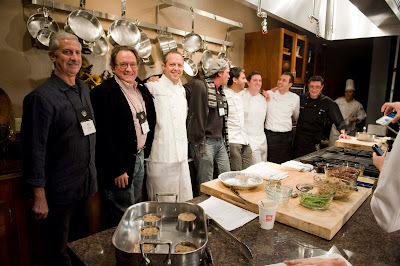 cooking at CIA-Worlds of Flavor.> Photo by Gerry Dawes©2009. Albert Asín (Pinotxo, La Boquería, Barcelona). Photos by Gerry Dawes©2009. Fernando Bienert (Director General, Prodeca), Jesus Bernard (Escritor de vinos). World Flavors…On a Stick, In a Bowl, On the Run…A Game Changer? Gerry Dawes was awarded Spain's prestigious Premio Nacional de Gastronomía (National Gastronomy Award) in 2003. He writes and speaks frequently on Spanish wine and gastronomy and leads gastronomy, wine and cultural tours to Spain. He was a finalist for the 2001 James Beard Foundation's Journalism Award for Best Magazine Writing on Wine, won The Cava Institute's First Prize for Journalism for his article on cava in 2004, was awarded the CineGourLand prize in 2009 and received the Association of Food Journalists 2009 Second Prize for Best Food Feature in a Magazine for his Food Arts article, a retrospective piece about Catalan star chef, Ferran Adrià. serieson wine, gastronomy, culture and travel in Spain. If you enjoy these blog posts, please consider a contribution to help me continue the work of gathering all this great information and these photographs for Gerry Dawes's Insider's Guide to Spanish Food, Wine, Culture and Travel. Contributions of $5 and up will be greatly appreciated. Contributions of $100 or more will be acknowledged on the blog. Please click on this secure link to Paypal to make your contribution. With tip of my sombrero to Salvador Dalí, whose genius persists in memory. Periodically I, Geraldo (one of my nicknames), rate restaurants or experiences in Spain with 1-5 Salvador Dalí Persistence of Memory Melting Watches. You will find my ratings at the top of some posts. A Visual Encyclopedia of Spanish Gastronomy: Food, Chefs, Restaurants and Wine (A Work in Progress). Dishes, cheeses, olive oils, wines, restaurants, etc. (Illustrated with photographs; frequent new additions and updates. El Crucero in Corella (Navarra), Lunch with the Wines of Aliaga at One of the Great Restaurants of Navarra's Ribera Baja Wine-growing Region, Also Home to One of Spain's Greatest Vegetable Growing Regions. Highly Recommended Book: Pamplona--Running the Bulls, Bars and Barrios in Fiesta de San Fermín by Ray Mouton. José Andrés's Opening Party at Crystal City Jaleo in June for the Annual Jaleo Paella Festival with Guest Chef María José San Román of Monastrell and Taberna del Gourmet in Alicante.